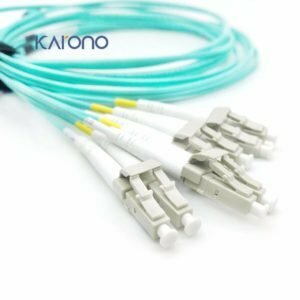 Karono manufactures and distributes a wide range of MTP/MPO products including Single-mode or Multimode MPO and MTP fiber cable. Multi fiber ferrule connections used in high-density backplane and Printed Circuit Board (PCB) applications in data and telecommunications systems. High density MTP/MPO trunk cables with up to 288 fibers in a single cable. 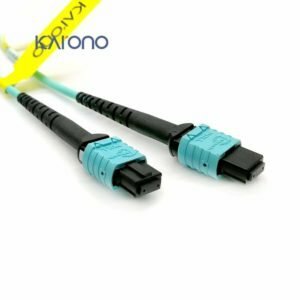 The MPO fiber cable connector offers up to 12 times the density of standard connectors, providing significant space and cost savings. The MPO/MTP connector, specified and standardized in IEC 61754-7 and TIA/EIA 604-5, beside the LC fiber optic interface is the first choice for ITS (Information Telecommunication System) in tomorrow‘s bandwidth-hungry, high speed commercial buildings and data centers. It can be either used for parallel optics applications such as Infiniband with data rates up to 120 Gb/s and for the upcoming 40 Gb/s and 100 Gb/s Ethernet protocols via Multimode OM3, OM4 and OS2 fiber. Similar to the well-known MT-RJ connector, the MPO/MTP houses several fibers in one single high-precision ferrule that can be PC or APC polished with a typical insertion loss of 0.25 dB, return loss of >60 dB for Singlemode and insertion loss of 0.2 dB, return loss >30 dB for Multimode.. The MPO/MTP fiber cable can be mass terminated in combinations of 4, 8, 12, 24 and 48 fiber ribbon cables. Optional Lengths available. 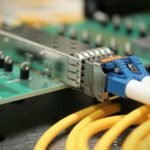 Pre-connectorized MPO/MTP assemblies for reduced installation time with plug & play functionality. Ribbon cable MPO/MTP Patch cords, FanOuts and Harness‘ with a reduced cable diameter consuming less space in cable ducts, conduits and path ways for optimized air circulation in raised-floors. Easy moves, adds and changes due to scalability and modularity of the product design for reduced down-times and faster installation. In order to offer users the migration path from 10 Gbit/s to 40 Gbit/s the Telegärtner MPO/MTP product family refers to polarity A.
Factory-assembled with measurement report for high, enduring reliability and performance.